Best weather forecast, accurate position your. What the weather forecast today? What the weather tomorrow?. 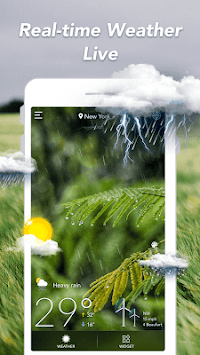 The accurate weather app can provide you a detailed weather forecast which is weather monthly, weather weekly, weather daily, weather hourly, wherever you are! The weather provides current detailed current weather forecasts and weather forecast observations from all over the world. The weather forecast also provides current atmospheric pressure, weather online conditions, visibility distance, relative humidity, different unit precipitation, dew point, wind speed and direction, and ten days ahead. 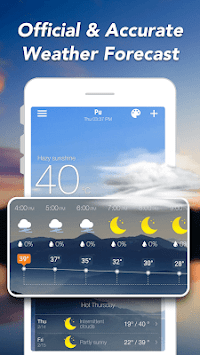 Forecasts and hourly weather forecasts. Detailed real-time weather reports, including real-time weather conditions and temperatures, “feeling” temperatures, precipitation, UV index, humidity, visibility, pressure, pollen count, sunrise and sunset times. Detailed weather forecasts, including weather conditions, maximum/minimum temperatures, precipitation, wind, etc. You can check all of this data every day or even every hour. Tell you to bring an umbrella with you before it rains. Inform you the real-time weather alerts and warnings. 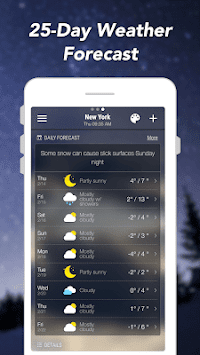 Easily check the current & future weather info via widgets in 2*1, 4*1, 4*2, 5*1, 5*2 sizes. In the meantime, all weather widgets can switch between different themes. Weather Forecast, 天气预报, 天氣氣象預報, Vejr, Wetter, Tiempo, Panahon, Météo, मौसम, Meteo, Tempo Metereologico, 天気予報, 날씨, Clima, thời tiết, Погода, прогноз погоды, Hava Durumu Tahmini, Vær, Pogoda, etc.